Preparing a GST report allows you to easily file your GST return with IRD and know exactly how much GST you owe or are owed. 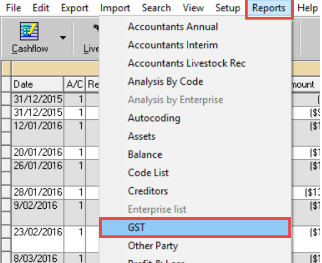 Cashmanager RURAL makes GST reports easy as the bulk of the work has already been done as you enter and reconcile your transactions, so all you need to do is review the report before filing your GST return. When should I prepare a GST report? Check with IRD (or your accountant) what frequency your GST returns are required. Businesses can choose to file GST returns monthly, bi-monthly, or six monthly. How often you do GST reports will depend on the frequency of your GST returns. How do GST reports work? Your GST report will automatically pull relevant transactions over from your transaction screen. Will they be pulled over to your current GST report? Transactions from a previously finalised GST report NO. Transactions within the GST period of the report that are coded as B (Business), including unreconciled transactions YES. Transactions within the GST period that are coded as P (Personal) or E (Exempt), including unreconciled transactions NO – GST for these transactions is listed on the report but won’t be included in the GST owing/credit amount. Newly created retrospective transactions that are from a time frame before the current GST period of the report e.g. reversal transactions YES - as these would not have been included in a previous GST report. Transactions dated after the GST period of the report NO. How do I create a GST report? 1. Check all transactions for the GST period have been reconciled. TIP: Use the Filter button to quickly see if you have any unreconciled transactions. The last thing you want to do is claim or declare GST on items that shouldn't be in the GST return. a. delete them from the Transaction screen. b. adjust the transaction date to be after the return period (this would apply if customers pay by cheque and are waiting for it to clear). The screen for creating a GST report is slightly different between the NZ and Aus databases. 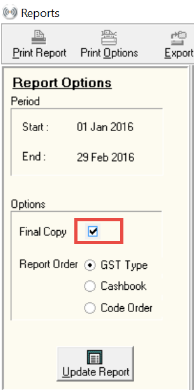 Check and enter the relevant details into the GST report screen. Period Start: The beginning of the GST period you are processing - always the first day of the period covered. If it is incorrect, select the correct date from the dropdown list. Period End: The end of the GST period you are processing - always the last day of the period covered. If it is incorrect, select the correct date from the dropdown list. 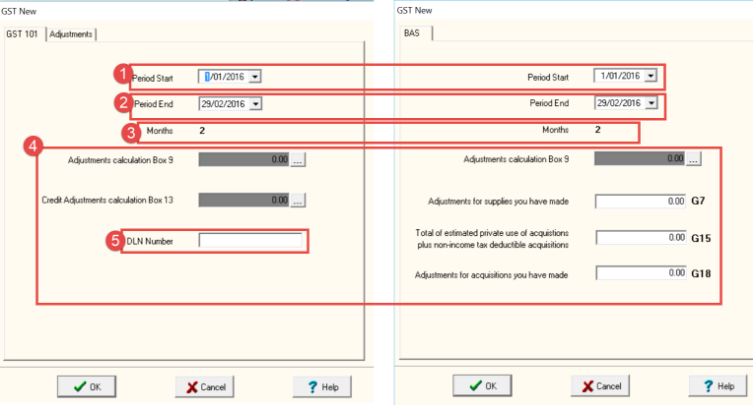 NOTE: Cashmanager RURAL automatically calculates the Period Start and End of the GST report, based on the financial year end you selected for your farm business. Months: How many months are included in the GST report i.e. one monthly, two monthly or six monthly. If you need to correct this field, adjust the Period Start and/or End dates. Adjustments: To enter any adjustments, click on the (...) next to the relevant box and enter the amount. For Australian databases, enter the appropriate figure into boxes G7, G15 and G18 if necessary. 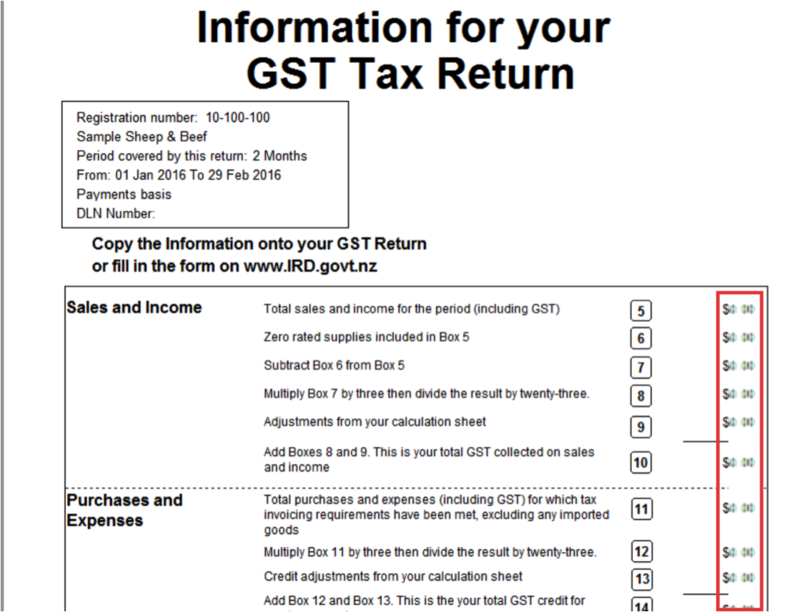 DLN number: For New Zealand databases, the DLN number can be obtained from the paper GST return sent by IRD. However, if you file your GST return online, you don't need to enter a DLN number. The GST report displays a detailed list of all transactions that are included in the GST return period. If your farm business is invoice basis for GST, transactions are included based on the invoice date entered into the Transaction screen while payments basis GST includes all transactions with a transaction date in the GST period. The report is divided into GST types. Each GST type will only appear in the report if transactions have been allocated to it. Print the report and go through each transaction listed to ensure you have allocated the correct code and GST type. Locate and edit any transactions in the transaction screen, that need to be corrected. Once you have reviewed the GST report and are happy to file it with IRD, you need to finalise it. Finalising the GST report locks the transactions into the GST period and allows you to create a new report for the next GST period. Preview the current report and tick the Final Copy box. Click Print Options then either OK to print the report or Cancel to exit. The Final Copy box will now show ‘(Printed)’ this finalises the report and you cannot change the details of any transaction in the report unless you reset the return. Close out of the report and use the figures from the first section of your GST report to fill in the information on your GST return in the IRD website - myIR. If you have any questions relating to the mechanics of GST, what to claim, or what adjustments have to be made, we strongly recommend you refer to your accountant and/or tax department.